I've been gaining some weight over the past few years so I am starting a new self-directed weight loss plan. I have a stair stepper. In the past what would happen is that I would start off slow and keep increasing the number of flights I would climb each day until all the excess weight was gone. It would usually end with me climbing 200-400 flights of stairs while watching a TV show or a movie. I'd feel great but at some point I'd lose interest and stop though. The cycle would then repeat. So here's a more realistic long-term sustainable weight loss plan. It is an Illusion of Prosperity exclusive. Anyone can do it. Feel free to join me! I will climb 20 flights of stairs each day just before taking a bath or a shower. It takes somewhere between 4 minutes and 8 minutes depending on my mood and fitness level. I will also drink a 12 ounce glass of water. If for some reason I cannot climb 20 flights of stairs (or their equivalent), then I will take a 20-minute walk instead. That's it. That's the entire plan and I intend to follow it for the rest of my life (or as long as I am physically able). I will not be consciously changing my diet, although I do expect it to change. I tend to eat differently when I have more energy and I am confident that this plan will give me more energy. I will not be consciously changing my level of physical activity elsewhere, although I also expect it to change for the same reason. I'll be charting my weight in the years to come and showing the results at the end of each month on this blog. I'm 6'3" tall and weigh 225 pounds. It is my intent to get back down to 200 pounds (or less) and stay there permanently. I will be climbing 7,300 flights of stairs and burning roughly 32,000 calories (the equivalent of 10 pounds of butter) per year. Since I have been gaining about 3 pounds per year, I would therefore expect it to take me 3-4 years to get down to my goal, all things being equal. I think it will probably work better than that though, since it should give me more energy and I tend to eat less and move more when I am not tired. I've been testing this plan for the past few days. As in the past, I am very tempted to increase the number of stairs I climb. Who doesn't want quicker results? Instant gratification doesn't work long-term though. If I increase the number of stairs I climb then I will simply lose interest again someday. That's my theory anyway, based on past results. This plan officially starts on June 1, 2011. I'll be posting my first chart of the results at the end of June. Don't expect to be blown away. I'd be surprised if there is much to be seen at all. There might even be some weight gain. Who knows? It is only the long-term that matters to me. I can say with 100% certainty that I will not regret this decision. At the very least, it will do no harm. Who knows, maybe someday the results will even inspire me to write a common sense weight loss book. Wouldn't that be something? It would be a one page book with a long-term chart, lol. 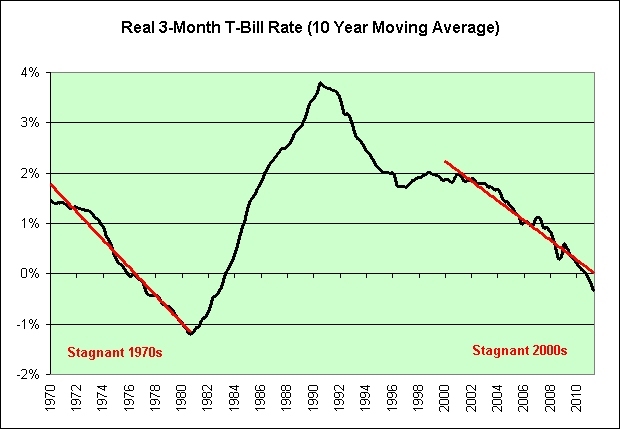 The following chart shows the 10 year moving average of annual inflation adjusted 3-month treasury bill returns. It is an oil speculator's dream come true. Do you want to know what else is an oil speculator's dream come true? Gregory Mankiw! They can see the unintended consequences of his negative real interest rate theories even if he can't. 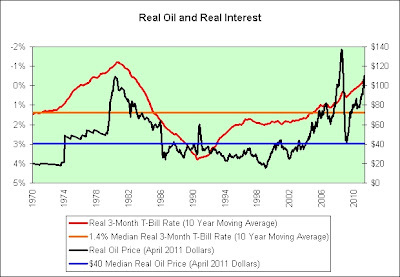 Let's add the inflation adjusted price of oil to that chart and also add median values to strip out bubble activity. I would argue that if short-term inflation adjusted interest rates had been kept nearer to their median value of roughly 1.4% then inflation adjusted oil prices would be nearer to their median value of roughly $40. 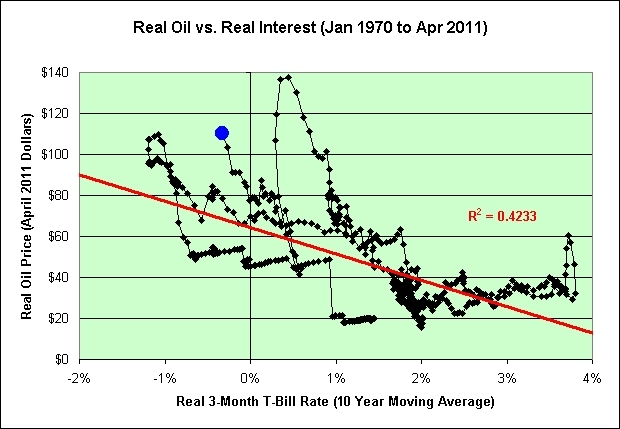 In other words, oil prices could be more than double their typical value due to interest rate considerations alone. How is this helping? Do higher oil prices help homeowners make their mortgage payments? No. Are wages double their typical value too? No. The following chart attempts to show the correlation between short-term interest rates held low over an extended period and higher current prices for oil. The blue dot shows where we are right now. I also want to point out that over the last year, investors have lost roughly 3% of their purchasing power in 3-month treasury bills. 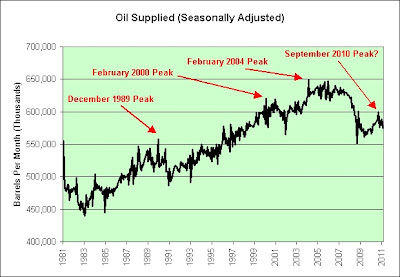 If this had been the trend for the last decade then this chart would imply oil's price would probably be even higher than it is now. 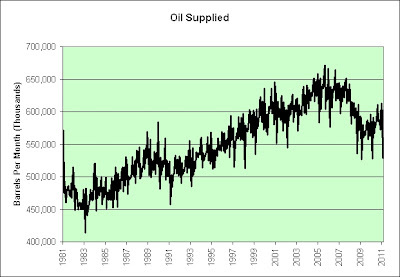 I would therefore argue that oil speculators are trying to extrapolate even further into the future and they continue to like what they see. So here is my theory in a nutshell. Investors don't rush into hard assets based on temporarily low interest rates. The long continuous grind of lower interest rates on savers and/or speculators eventually makes them hoard hard assets. Those who see the problems coming hoard early and make out like bandits. Those who hoard too late end up being the bagholders someday. It is that grind that makes them act. It explains the oil, gold, and silver bubbles in the late 1970s and it also explains them now. Keep in mind that it is just a theory and opinion. I could be wrong to think this way. I will once again say that I have absolutely no desire to hoard oil, gold, or silver at these prices though. The lowest lying fruit from those trees was picked years ago. Only the riskiest stuff is left. I wish I could say when this "ultimate bubble" process will end, but I've been predicting low real interest rates since starting this blog. That said, unless the Fed intends to allow hyperinflation without a fight then there will come a time when they will be forced to act. They won't have a choice, any more than Volcker did. And lastly, if we actually slide into Japan's deflationary mess then short-term real interest rates will rise. Short-term savers in Japan have not been punished like short-term savers here have. In other words, it might not even take a Volcker. In my second chart I intended to use the median values but instead used the average values. That has been corrected. I have also inverted the interest rate scale to better show the relationship (hat tip to Rob Dawg at Calculated Risk). mab pointed out in the comments that my median value still didn't look right. In my haste to make my last correction I accidentally used data going all the way back to 1946. Two wrongs didn't make a right. I think this deserves a personal blunder tag so I'm adding that too. D'oh! I'm fairly sure it is all correct now though. 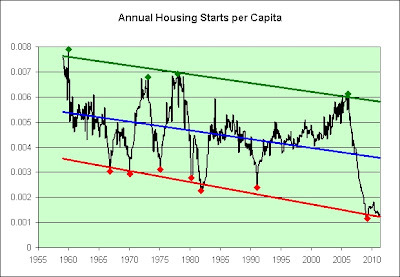 The chart shows annual single unit housing starts per person. 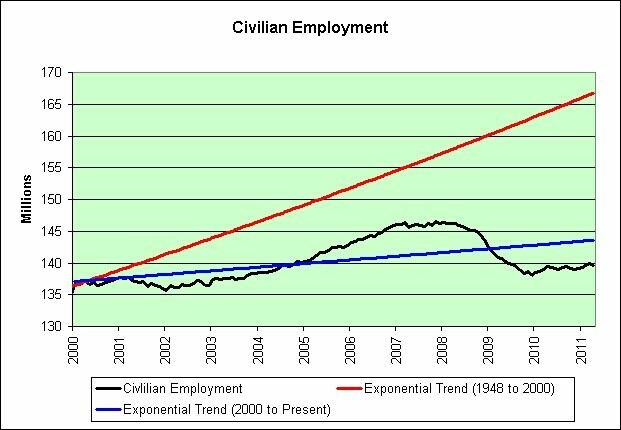 The green trend line is through the largest booms. 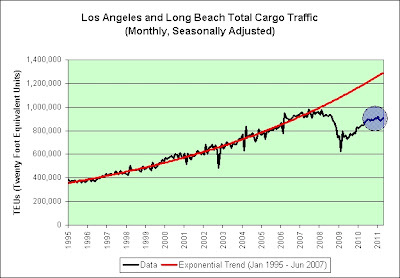 The blue trend line is through all of the data. 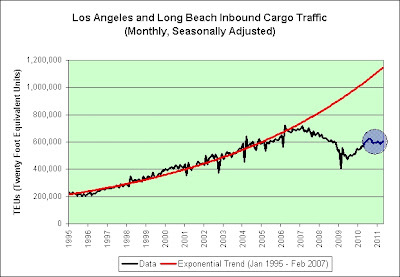 The red trend line is through the largest busts. 1. From a housing start perspective, this boom and bust was virtually identical to previous booms and busts. The Fed should have easily seen this coming. Very near the peak we were told there's no housing bubble to go bust though. 2. Look at each of the prior major busts. Housing starts bounced high once the bottom was found. There's a name for our most recent bounce though and it has both dead and cat in it. Sigh. 4. Inflation has convinced investors time and time again that prices only go up. Inflation is the problem. It distorts our opinions. It leads to malinvestment. 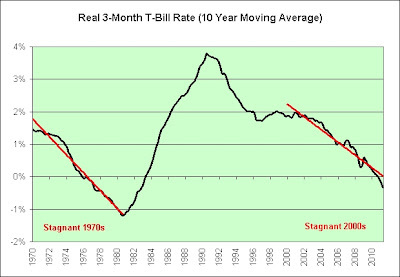 Some would argue that we just need more inflation right now and our troubles will be solved ($100 oil notwithstanding). 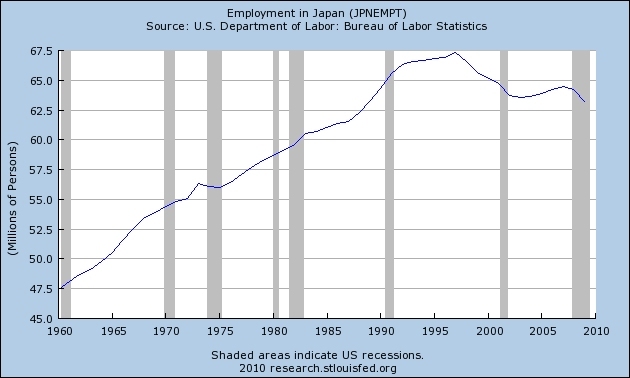 However, look at the 1970s in that chart. Most of the red data points are from that era. Keep in mind that those red points also represent missing construction jobs. 5. And lastly, I turned bearish in 2004 due to our ultra low rate interest rate policies and their impact on debt and housing. 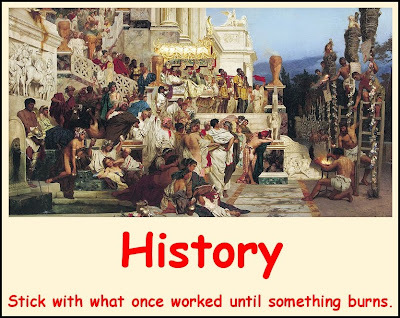 How have those policies worked out for us so far? If you think I'm going to turn bullish because we're still trying these very same "free lunch" policies then get used to disappointment. Over the 10 year period starting in 1999 the average annualized excess log return on 10 year TIPS equaled a substantial 4.16 percent, almost a full percentage point higher than that on comparable nominal US government bonds. In general, insurance costs money. TIPS offer some inflation protection and protection is a form of insurance. However, TIPS investors have been paid to take this insurance. I will simply repeat my long standing theory on why this has been true. Investors who fear serious deflation will buy nominal treasuries. Investors who fear hyperinflation do not buy inflation protected treasuries though. They buy hard assets instead. In other words, at least some of the money that would consider buying TIPS during inflationary periods has been diverted elsewhere. This is why I believe that there is error introduced when trying to determine inflation expectations from the difference in yields between nominal treasuries and treasuries with inflation protection. If my theory is correct, then actual inflation would tend to be higher than the bond market's expected inflation. This is what we have seen. Over the long-term, higher inflation than expected would therefore reward TIPS buyers over those who buy treasuries without inflation protection. The authors find strong empirical evidence for two different potential sources of excess return predictability in inflation-indexed bonds: real interest rate risk and liquidity risk. There's no mention of my deflation/hyperinflation theory here of course. I'm not a Harvard economist. You won't be able to find proof of my theory in a data table. I'm relying on common sense and anecdotal evidence based on my own purchases. So let's discuss their reasons. * Real Interest Rate Risk: This is something I have been comfortable with over the long-term, mainly because I thought real rates would fall (as our economy stagnated). That risk therefore turned into a reward. * Liquidity Risk: This is a very minor risk for me. I buy and hold until maturity. I'm not intending to require a greater fool to buy these long-term TIPS bonds back from me. I'm not immune to the risk though. There is some here. I may be forced to sell someday for reasons outside of my control. The primary reason I would be forced to sell TIPS would be if inflation became so high that I'd have to sell some TIPS just to pay the taxes on the inflationary gains. As far as my personal finances are concerned, I would therefore argue that TIPS have LESS liquidity risk than nominal treasuries. If inflation was running that hot then I'd have a much easier time finding buyers for TIPS than those selling treasuries without inflation protection. In conclusion, I believe that long-term TIPS offer better risk adjusted returns than long-term nominal treasuries. I have felt that way for the past decade and I continue to believe that looking forward. That may not be true in the short-term though. As seen in the upper left hand corner of my blog, I tend to lean a bit deflationary right now. Here's the real benefit of TIPS to me. I can hope that I am wrong. As a holder of TIPS I would love to see inflation average 0% for the rest of my life (much like Japan has done over the past decade or so). At least I would not have to pay tax on the inflationary gains. From a purchasing power perspective, I would not be doing as well as those holding nominal treasuries but I'd still be doing quite well. Disclosure: The bulk of my nest egg sits in TIPS and I-Bonds. Ravens squawk from the rooftop of a deserted building, once a top producer of animal feed that employed hundreds in Zimbabwe's second city of Bulawayo. Empty factories are now a common sight in Bulawayo's industrial district as the economy struggles to recover from a decade-long crisis, with firms downsizing, closing or relocating to the capital for better opportunities. Amid the crumbling ruins within the city is a growing circle of urban artists armed with spray-paint cans. They're determined to make bold, colorful statements out of mostly derelict structures, despite criticism from some in the city who see graffiti as vandalism. You probably won't find these charts anywhere but here. 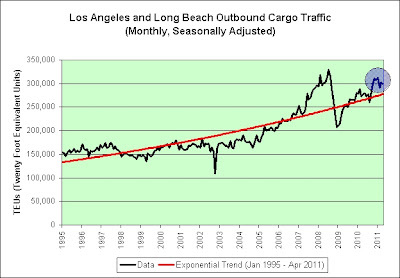 I have once again seasonally adjusted the port traffic data of Los Angeles and Long Beach. They allow you to see what's going on in nearly real-time. I was looking for more evidence of consumption austerity. I found what I was looking for. It appears that the consumption recovery is stalling. 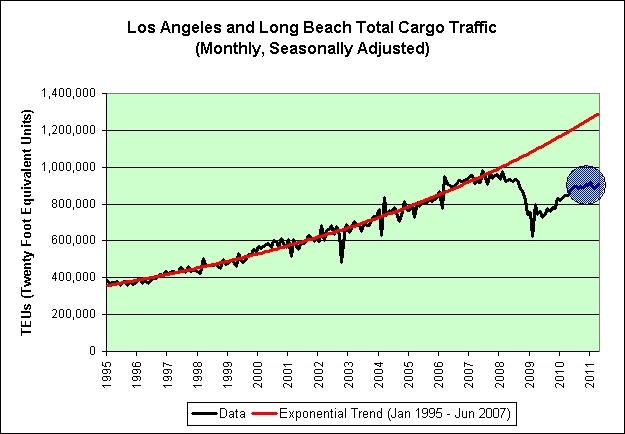 It appears that exports have peaked. 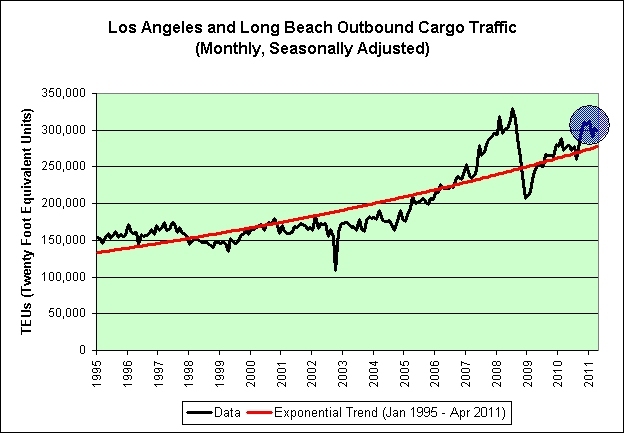 It appears that total port traffic is stagnating. In the real world, things don’t change that quickly. The past seven expansions lasted 71 months, on average. The current one is not quite two years old. And by some metrics, it has yet to get going. 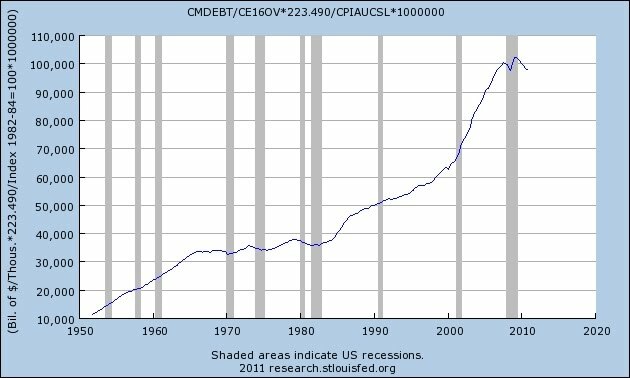 So if you think the U.S. economy is headed into recession in a matter of months, then I have some Greek debt to sell you. I don't want Caroline Baum's Greek debt. She'll have to find someone else to take it from her. Using her logic, the Fed can permanently prevent further recessions by simply keeping short-term interest rates really low. It seems like such a simple and easy fix. Somebody needs to inform Japan. They've been trying that very same technique ever since their housing bubble popped. They just need more patience! It is bound to work someday. Despite the economic recovery in the 2000s, most of the conspicuous consumption of the 1980s, such as spending on whiskey and cars, had not returned. This was due to the traditional Japanese emphasis on frugality and saving, and also because Japanese firms that had dominated the 1980s, such as Sony and Toyota, were fending off heavy competition from rival companies based in South Korea and Taiwan. 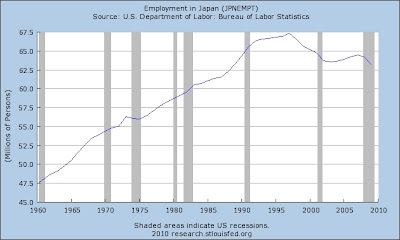 Most Japanese companies began to replace their permanent work force with temporary workers who had no job security and fewer benefits, and these non-traditional employees now make up over a third of Japan’s labor force. That could never happen here of course. YOUNGSTOWN, Ohio -- Because so many companies in the Mahoning Valley remain wary of hiring full-time employees, more and more are turning to temporary employee agencies to fill their staffing needs. The Home Ownership Participation for Everyone (HOPE) Awards is a national industry awards program that was created in 2001. At the 2011 HOPE Awards we will celebrate 10 years of helping make the dream of owning a home possible for Americans of every background. "Given the great affordability conditions, job creation and pent-up demand, home sales should be stronger," Realtors Chief Economist Lawrence Yun said in a news release. Banks foreclosed on 69,847 properties in December, bringing the year's total to 1.05 million, topping the prior record of 918,000 homes seized in 2009, real estate data firm RealtyTrac said. Employer medical costs are expected to rise 8.5 percent in 2012, up from 8 percent in 2011, in part due to pent up demand from those who delayed care during the economic downturn, according to a report published on Wednesday. Mr. Yun, this musical tribute is for you. I've got to hand it to you. You've got balls. As Brad says, these estimates now suggest that we have now gone through a year and a half of “recovery” that has failed to make any progress toward closing the gap between what the economy should be producing and what it’s actually producing. Apparently there is some sort of gap between what the economy should be producing and what it is actually producing. I can only assume that they mean debt. Our country simply isn't producing enough of it. It certainly can't be the production of goods and services. I see no shortages of anything that I either need or desire. For example, I'm confident that I could have my pick of many restaurants this very evening without even making a reservation first. Since deficits saved the world from the second depression, I wonder how much higher our deficits will need to go to save us from a third depression? And a fourth? And a fifth? 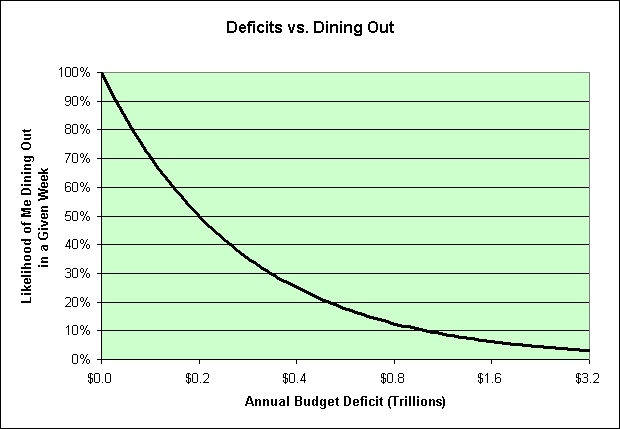 Put another way, how high will the deficits need to go before I feel so financially safe that I would be willing to trade part of my long-term retirement nest egg for short-term dining out experiences? I think my answer might shock them. Here's a ballpark chart. Perhaps I'm simply not extrapolating it out far enough. It could be true. 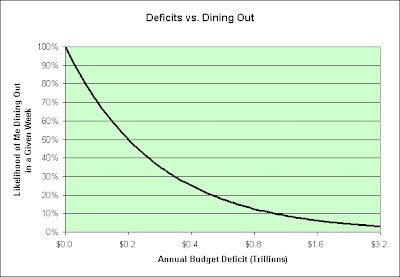 $100 trillion deficits would tempt me to convert all of my nest egg into one last meal. Something is better than nothing I guess. That last meal certainly won't feel like a free lunch though. 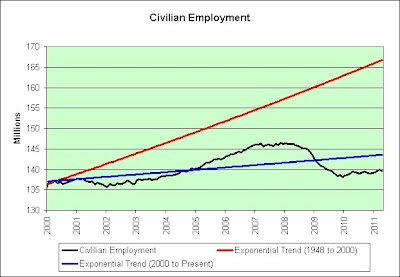 This chart shows the natural log of civilian employment. Constant exponential growth rates therefore show up as a straight line. The trend line in red is not a straight line though. I'm using a 3rd order polynomial as an attempt to fit it. 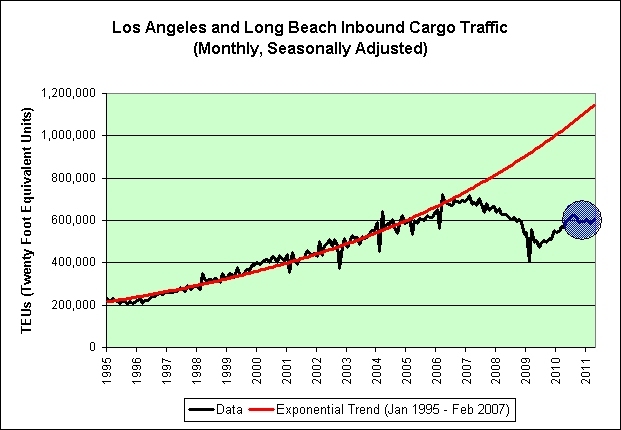 In previous posts I showed that the long-term exponential trend has died and there's no going back to it. It is not mathematically possible. I did not offer a new trend to replace it though. I'm not a big fan of using polynomials to predict the future, but they do offer a pretty good glimpse of where we currently are. As seen in the chart, that glimpse is mighty ugly. 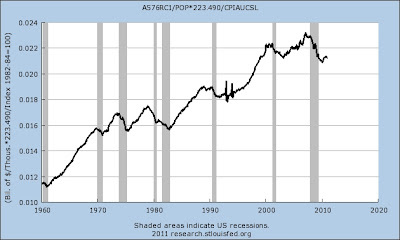 Anyone who thinks that we can continue to automate and outsource jobs away because it hasn't hurt us in the past might want to stare at this long-term chart for a while. We've been losing job creation momentum for decades. It is not an unexpected new problem that has suddenly appeared. 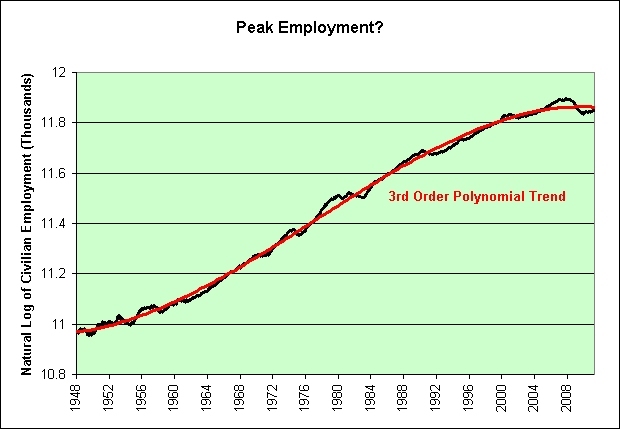 As a side note, the 3rd order polynomial was chosen because it allows both the increasing growth due to women entering the workforce (as seen in the left half of the chart) and the decreasing growth due to automation and outsourcing (as seen in the right half of the chart). The former is done. Women now make up about 50% of the workforce. The latter continues on though. I am not attempting to make predictions about the future here. 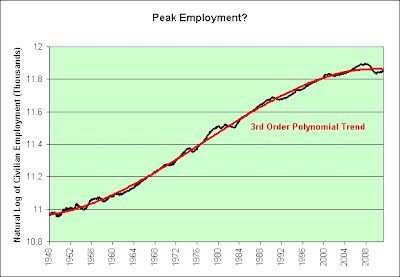 I'm simply pointing out that there is a risk that we have seen peak employment. We are 6.9 million jobs below the peak set in November 2007. That was 3 1/2 years and trillions of borrowed dollars ago. MaxedOutMama has a post showing the connection between the amount of oil we use and the employment rate. This is my attempt to enhance that connection. First we'll start with the oil supplied. The data is fairly noisy. Let's try to strip out the seasonal effects using the seasonal adjustment program provided by the Census. That makes it much easier to see what is going on. We should probably not be encouraged that the seasonally adjusted peak was in September 2010. The economy may now be running on vapor. 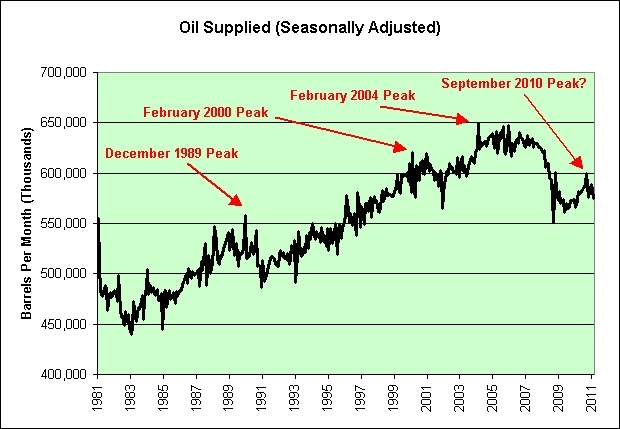 The data only goes to February 2011 but I seriously doubt that oil rising to $100 has improved the situation. Now let's add employment to the mix. 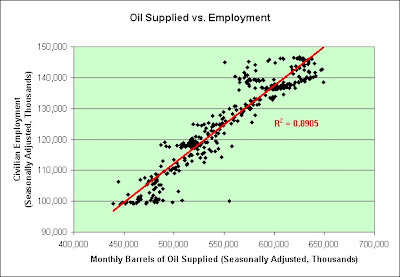 Since at least 1981, there has been a very high correlation between oil used and employment. Correlation does not prove causation but I think it stands to reason that when people have jobs they are more likely to drive more (at the very least to commute to work). Now let's show the data in a slightly different way. 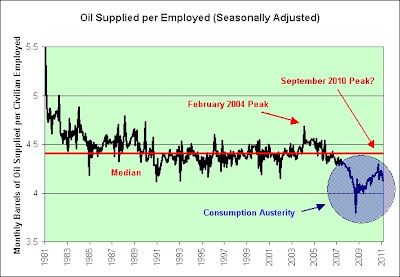 In my opinion, the high price of oil is creating consumption austerity. I certainly have it. I'm less likely to leave the house and visit this country's many restaurants and strip malls when gasoline prices are high and I can't trust my nest egg to hold its value. I'm told deficits saved the world. We'll just see how that works out long-term. Deficits (and QE2) are also propping up the price of oil. 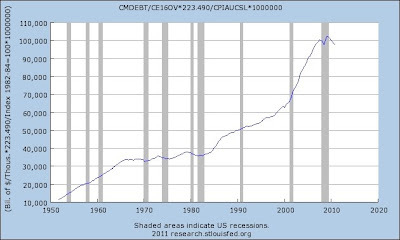 I turned bearish in 2004 based on our country's debt problems. Oil was under $50 per barrel. I'm at least as bearish now as I was then. Go figure. This is not investment advice. I can't tell you what the price of oil will do in the future. There's a battle being fought between deflation and inflation. Inflation is currently winning but it was also winning in 2008. We know how that worked out. It might be a good time to bet on continued consumption austerity though. I doubt we make it back to that red median trend line any time soon. The next recession in the U.S. "is years away," the chief U.S. economist of the financial giant Goldman Sachs said Tuesday. Just keep in mind the following. The deals came up again last month in a blistering, 650-page report on the financial crisis from the Senate's Permanent Subcommittee on Investigations. The report says that Goldman marketed four sets of the bonds to banks and other investors without telling them that the securities were very risky. It said Goldman secretly bet against the investors' positions and deceived the investors about its own positions to shift risk from its balance sheet to theirs. If they are willing to do that to their own investors, then just imagine what they would be willing to tell the public in general. Good buy? Every home sold! Then there's oil! Then there's oil! Then there's oil! Oh no no! Oh no no no no no no! Will our debt just grow? Think it won't? They will let it grow! They will let it grow! Shoot me! Let it grow? For me? For me? For me? So he thinks he can force me and get me to buy? So he thinks he can get me to believe the lies? They want to go back. We have to stop them. This is actually a "faux" movie trailer. I thought it appropriate based on the fauxiness of our prosperity. The act of faux going out with a girl or boy. A situation where they believe you are in a monogamous relationship but your action, when not with them, do not reflect this fact. Here's an example. The Fed is fauxing out the public while simultaneously courting our banking system (their one and only true love). So without further adieu, here's the musical tribute. He won't do us no harm, no, ha! Now we see him, he's claiming, "Unforeseen!" He makes us want to blame the mainstream! You will note that the "x" in "faux" is no longer silent. I can explain. What we actually have is cunning central bank fox paws and a physical loss in balance sheets. The distinction is important and yet subtle. "I kind of think we're looking at some type of echo in the credit crisis coming up here. That's what I'm sort of afraid of," said Gundlach, whose firm has almost $11.2 billion in assets under management. Jeffrey Gundlach is worried. He thinks we've been "mind numbed" about housing and subprime. Check out the video. It is well worth your time. TOKYO — A drastic drop in demand for foodservice outlets has rolled across Japan since the triple calamities of earthquake, tsunami and atomic reactors meltdowns hit the island nation two months ago. Meanwhile, I'm bracing for more calamities right here in the USA. Despite the ever growing popularity of Food TV here in the USA, I have no desire to open a new restaurant business. Go figure. Councilman Jeff Prang talks to Time Warner Cable Local Edition host Brad Pomerance about the state budget crisis and how it affects local cities, like West Hollywood. "We're going to have homeless people. We're going to have inmates being released from prisons. We're going to have seniors and the disabled who don't have any services and you can't just abandon these people so it's going to cost cities more money." "The expansion of City Hall and the building of the new automated parking garage not only will provide for a better experience to residents and visitors, it will also provide for much needed additional parking while reducing the carbon footprint that a "traditional" parking structure would generate otherwise," added Mayor Duran. * Shoup documents construction costs ranging from $13,712 to $31, 500 per space at a California university between 1990 and 2002. He notes that most spaces in parking structures cost more than the cars that occupy them. * Shoup calculates that, including on-street parking, US cities have an average of about of eight parking spaces for each car. * For each dollar motorists spend directly on their car somebody bears more than 50¢ in parking costs. * Users pay directly for only about a quarter of total parking costs. The rest are borne indirectly through taxes, reduced wages, and additional retail prices. * Rideshare passengers, buses, trolleys, walking and telework incur no user parking costs. This should not be taken as advice to short precious metals. I'm not. I'm just watching from the sidelines. I can say this though. 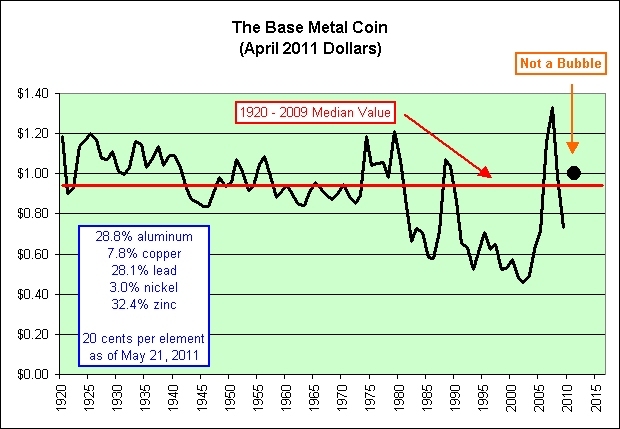 I have absolutely no desire to buy that precious metal coin. 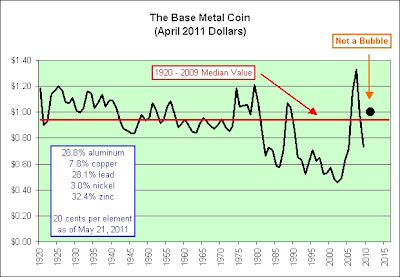 If I was tempted to buy a "hard asset" coin because I was confident that inflation was headed our way, then it would definitely be the base metal one. Since we are a debt-based society, I would argue that there is debt chasing any investment that appears to be a "sure thing". Silver’s Dip will be Brief! The bubble in stocks in 1929 was caused by debt financing. The bubble in housing in 2007 was caused by debt financing. You cannot borrow money to buy silver. Thus, silver is NOT in a bubble. I disagree. Since you can now buy and sell silver just like you can buy and sell stocks (through SLV), you can now borrow money to buy silver just like you could borrow money to buy dotcom stocks. The mechanism is identical. The only real debate is whether or not investors have chosen to do this. This is by no means proof that investors have borrowed money to buy silver. It is a smoking gun though. They've certainly borrowed money to buy something (perhaps everything since the entire market has been a "sure thing" in recent years). It is thought experiment time. Let's say short-term real interest rates are -2%. That means you lose 2% of your purchasing power every year by investing in short-term interest paying treasuries. That's pretty much the case now and it was pretty much the case in the 1970s. The end result is pretty much the same, right? Just look at oil prices. Now let's assume you can borrow at 5% above the 3-month treasury bill rate. If nothing else, it could be a home mortgage. This is not the same clearly. What implications would this have? Let's assume that you can devote $10,000 per year to interest payments, that you would like to make a leveraged bet on "sure thing" inflation, and that the bank only cares about your ability to service the interest on the money you borrow. Call it an interest only loan if you will. Is it any wonder we had a stock market bubble, a housing bubble, and at least one commodity bubble over the past decade? In this theoretical example, our ability to speculate has more than doubled since the 1970s. Let me sum up this theory. Real interest rates determine the desire to hoard assets. The lower they are the greater the desire to hoard/speculate (be it houses, oil, precious metals, toilet paper, and so on). Low real interest rates certainly influenced my behavior. Nominal interest rates determine the ability to hoard assets. The lower they are the greater the ability to hoard/speculate (be it houses, oil, precious metals, toilet paper, and so on). This did not influence my behavior because I am not a big fan of debt. It did affect the behavior of investment banks and home buyers though. There is severe bubble danger when you combine both the desire to hoard and the ability to hoard. I do think we have seen this bubble effect play out over the last decade in stocks, housing, commodities, and perhaps even stocks and commodities again. This is why I am not a fan of lowering interest rates and taking on more debt to solve our problems. They ARE the problems. They encourage speculation. It did not end well in the stock market. It did not end well in the housing market. It did not end well in commodities (think 2008). Apparently we're going to keep trying until it ends well. Good luck on that one! These are just my opinions of course. Business dropped just under 20 per cent in 2008. Our sales came back by about 8.5 per cent in 2009 and we got a sense that kind of level was not likely to change significantly. When we made the decision to close we gave everybody one year’s notice. It's a fascinating story from start to finish. Howes knew a year ago that he was going to close this Vancouver restaurant. Sales in Ottawa were up almost 60%, Calgary 51%, Winnipeg 24% and Greater Toronto 9%, it said. "Is there a bubble? No there's not, it's just underlying confidence," said Elton Ash, regional executive vice president, RE/MAX of Western Canada. Something sure seems to be underlying, perhaps right to our faces. At this point, using the measure above (median household income to median price), Vancouver is now more expensive than New York or London. And I am sure a lot less investment bankers work there, than in either of those 2 locales. MaxedOutMama just posted Japan - GDP. You will note that economists expected a considerably better result. "Ask yourself why you got into commodities in the first place," said Jeff Tjornehoj, senior research analyst for Lipper. "If you bought in because you felt your portfolio was not capturing the full market of securities, then you should have known that there is no free lunch and that the run would not go on forever. Backing away now would just reopen that hole in your portfolio. And if you have commodities in their proper place -- so that they are a smaller portion of your overall holdings -- there's just no reason to panic." It's basic economic human nature to get frightened when the stock market drops as much as did Thursday. And with 11 of the past 15 sessions ending in a triple-digit loss or gain, investors should be wondering what's going on. But most experts agree there is no reason to panic. How bad is that? Not a lot, but it's still important: Median-price decreases have been unusual in recent years. They signal that something negative is under way in the marketplace. But given the unprecedented run-ups in real estate prices during the boom years, plus near-record low mortgage rates fueling those fires, who is really shocked by a 1.2 percent decline? Small investors are being urged by financial advisors to ride out the storm on the London Stock Exchange. Richard Smith, an independent financial advisor with the IFS Group, based in Crawley, west Sussex, said: "There is no reason to panic. I think yesterday (Tuesday) was an overreaction, there's been a mortgage war for the last two years. This is a cyclical market place and it will correct itself." Treasury Secretary Michael Blumenthal acknowledged two weeks ago that the deficit was "worrisome" and added that it "certainly cannot be allowed to persist forever." However, he said, there is "no reason to panic and no excuse for reactions in ways that could jeopardize the overall health of the U.S. economy or that adversely affect world recovery in general. Two years ago, with wings catching on as a popular item at many casual dining chains, prices climbed to $2 a pound. But demand from many eateries has since fallen and with that the price of wings, which recently fetched just $1.02 a pound. If there is one thing we have learned over the past decade it is that the more government-guaranteed loans there are for a given industry the safer that industry becomes. The first explanation for the high loan volumes is the sheer number of restaurants. There is safety in numbers. Sheer numbers of competitors therefore implies sheer levels of safety. There has never been a better time to buy restaurant land. Clip not suitable for small children and those with heart conditions. Are Oil Prices a Threat to the U.S. Economy? I present you with two choices and you must pick one. 1. Close all of this country's gasoline stations for six months. 2. Close all of this country's restaurants for six months. Ken Fisher would have us believe that choosing option #1 would be better because gasoline is such an insignificant part of this economy. He's got a point. There are far more restaurants than gasoline stations. Fools might argue that closing all this country's restaurants for six months would be better though, because if all the gasoline stations closed then most (if not all) of the restaurants would close too. They would claim that it is an unintended consequence. Don't listen to fools though. What do they know? Stick with the professionals! Don't buy it. For months now the debate has been over whether America will have a hard landing or soft landing, the answer hinging on how big 2007's housing disaster turns out to be. Well, there won't be any housing disaster. We won't have a landing at all, soft or hard. Right now the U.S. and global economies are both accelerating. You can see right through the housing crash story by looking at the prices of housing stocks. The market knows what the economic worrywarts do not, which is that the housing sector is already making a comeback. In the last six months housing stocks are up 24%, well ahead of the overall market. If housing were destined to fall apart in 2007 these stocks wouldn't be so strong now. Does Jeremy Siegel Live in a Cave? Jeremy "Stocks for the Long Run" Siegel agrees with Fisher's outlook on the safety of higher oil prices. See? No worries! My mood is subject to change. For example, there is serious risk that $107 oil is not sustainable and that deflation will once again enter the headlines when we least expect it. Who really knows for sure? Oil is now just under $100, the household survey shows 190,000 jobs were lost in April, food services and and drinking places sales declined in April (showing that discretionary spending is on the ropes), and housing prices continue to fall. I'm therefore switching back to a deflationary mood. I'm not entirely comfortable with my decision since it means I am basically betting against Soros. While many who buy gold do so to protect against future inflation, Soros Fund Management bought gold to protect against the possibility of the opposite — debilitating deflation, or a sustained drop in consumer prices. But now the $28 billion Soros firm, which is run by Keith Anderson, believes chances of deflation are reduced, eliminating the need to hold as much gold, according to people close to the matter. It took me more than a few years to warm up to this theory. I think the key here is that the Fed has little power over wage inflation. It can't seem to stop the deflation in housing. It can apparently get investors to speculate and hoard commodities as a feeble attempt to make things better though. On the one hand you have people like me who are fine holding cash if deflation strikes again. On the other hand you have people who want to ride speculative bubbles and make a killing. Soros is and has been one such person. If commodities can be inflated (even if only temporarily) then clearly there is money to be made there. In the long-term, I think commodities will do what every other speculative bubble has done and I point to the silver to aluminum ratio as my evidence. Few appear to be speculating on aluminum in my opinion. Let's just put it that way. As we know, Blogger's had a rough time over the past day or so. It could be worse. Some analysts worry that the Fed, which has held rates at record lows since December 2008, could be fueling a new speculative period and potentially a future economic crisis. What are the odds of that though? Our masters certainly keep us busy. So many bubbles. So little time. Spot that hiring spree in the chart above and win a prize. MaxedOutMama posted concrete evidence today that the hiring spree was illusionary. So what does this mean? The "sure thing" inflation trade is, was, and will be at risk. I use past tense because silver is down 29% since its peak in late April. The divergence between IEF and TIP today also shows the risk. They are similar treasury bond funds. IEF offers no inflation protection. TIP does. IEF was up 0.36%. TIP was down 0.32%. In case you are interested, one of my larger TIPS bonds recently matured. I was tempted to put the money back into TIP but opted instead to earn 1% in an online savings account. It is money I will be needing over the next few years and I felt that the risk/reward for TIP wasn't sufficient. The bulk of my nest egg does sit in long-term TIPS and I-Bonds though. While the restaurant industry continues to see signs of slow recovery, more than two-thirds (76%) of U.S. consumers continue to report that they are reducing restaurant visits -- and that when they do dine out, they're trading down and ordering fewer items. Some might even argue that 76% is more than three-fourths. Those within the minority who are relatively unaffected by the economy also span all demographic groups, but -- not surprisingly -- are more likely to be employed, to live in affluent households, and to be generally more optimistic than those hurt by the recession. "We have a wall of costs heading toward us," Smith told analysts during a conference call. The results were worrisome to some analysts who think consumers won't be able to tolerate higher meat prices going into this summer, said Akshay Jagdale, an analyst with KeyBanc Capital Markets. Tyson! Say it isn't so! The wall isn't suppose to be moving! The name "chicken" has its origins in a game in which two drivers drive towards each other on a collision course: one must swerve, or both may die in the crash, but if one driver swerves and the other does not, the one who swerved will be called a "chicken," meaning a coward; this terminology is most prevalent in political science and economics. It's a cookbook. There are lots of chicken recipes no doubt. Thanks to mab for reminding me of this Twilight Zone episode in the comments recently. It was definitely one of my favorites. Be sure to check out the "Kanamits Offer Peace and Prosperity" headline at 1:52. I don't want to ruin it for you, but that prosperity was just an illusion. I think the photos say it all. Enjoy! Get your .999 fine copper bullion bars before the next person buys them all up. This is also a tribute to those who find actual value in pennies. You can buy them at a discount and since they are money, they even offer some deflation protection. The latter might just come in handy someday. As an added bonus, some of them might even be collectible if you take the time to look. With unemployment so high, what's the harm? I certainly can't argue with that logic. Seriously. 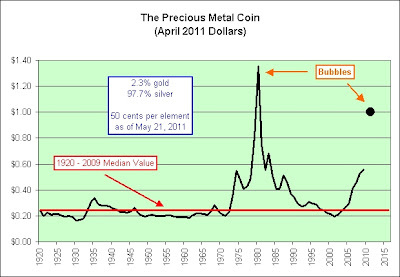 As of May 1, 2011 the Perth Mint in Western Australia will no longer offer free storage for unallocated silver. Now here’s the good news: All orders placed on or before April 26th will not be charged storage in the unallocated program. You will be guaranteed free storage for your silver for as long as it is held at the Mint. But to qualify, your Perth Mint order must be placed by April 26th. We urge you to consider doing today what you will not be able to do tomorrow – or at least the tomorrow after April 26th. And that is to buy unallocated silver at the Perth Mint with free storage. This chart shows the total household debt per employed person and is adjusted for inflation (March 2011 Dollars). This does not include federal government debt (which is roughly the same size). I think there's a good chance that deflation could strike again. Has the world already forgotten 2008? I think my short-term inflationary mood (as seen in the upper left hand corner of this blog) will be moving back to deflationary in the not too distant future. Part of me wants to do it right now but I figure at least some of these higher prices will trickle into the CPI. I figure that gives me a month or two. Maybe. I have no crystal ball. Keep that in mind. These are uncertain times and I remain uncertain. 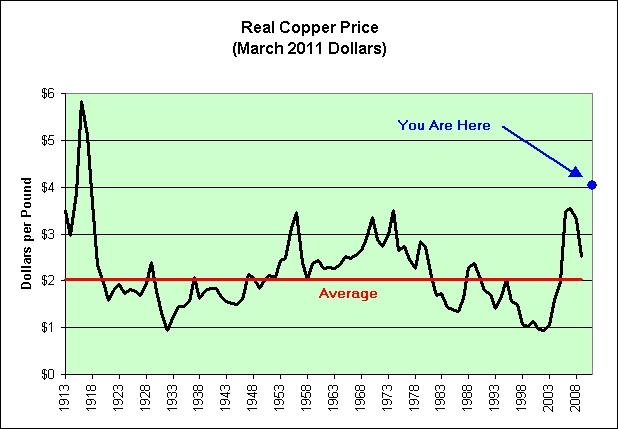 I can say that I have no desire to make a heavily leveraged bet that copper prices will skyrocket from here. That alone should make me deflationary. The price of key industrial metals has fallen further over the last four months than occurred during the worst years of Great Depression between 1929 and 1933, according to research by Barclays Capital. Here's a 2008 glimpse of how risky copper could be right now. This motivational poster (an Illusion of Prosperity exclusive) inspired by GYSC's comments from this post and the demotivational posters of Despair, Inc. Adjusted for inflation and interest earned on 3-month treasury bills through the secondary market (oldest data I could find), the 1934 dollar is currently worth $1.02. It is claimed that the dollar has lost roughly 95% of its value over the period and that this will continue into the future. I agree. I don't find that claim very useful though. I would not have been able to use that information to make investment decisions in the past nor could I necessarily use it in the future. 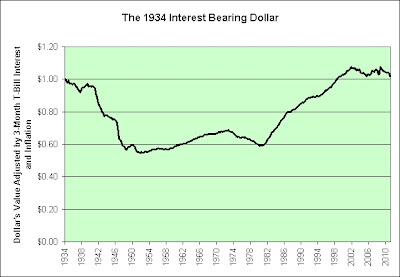 A much better argument, at least to me, is that the interest bearing dollar could do what it did following the Great Depression, throughout World War II, and during the 1970s (or at the very least not do what it did from 1980 to 2000). I am very sympathetic to this argument. One can still protect against this outcome though by simply buying long-term inflation protected treasuries and holding them until maturity. Taxes are not taken into consideration on this chart. They will certainly lower our returns. This is true with nearly all inflation hedges. Taxes on the inflationary gains rise as the inflationary gains rise. Worse, hefty inflationary gains can push us into higher tax brackets. Death and taxes are the only sure things. Sigh. Gold and silver are suggesting that the interest bearing dollar will do very poorly into the future. 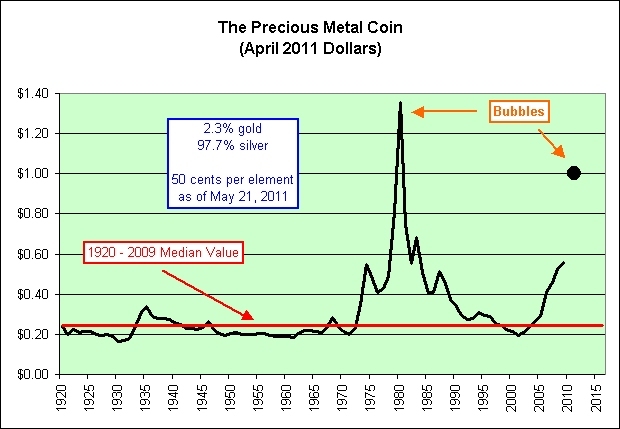 Even if true, that does not mean that gold and silver aren't already priced to perfection. Further, they could be wrong. Note how stable the interest bearing dollar has been over the past decade. That's not exactly the story I have been hearing from the gold and silver community. I suspect that the interest bearing dollar will fall some (perhaps a great deal) in the coming years thanks to our ultra-low interest rate policies and massive trade deficit, but I cannot prove it. If we slide into another deflationary mess then even a 0.0% interest bearing dollar would look pretty good. The following chart shows "wage and salary disbursements" divided by "total population" and then adjusted for inflation in March 2011 dollars. 1. The dotcom bubble shot us way higher. 2. The housing bubble shot us temporarily higher. 3. The commodity bubble will shoot us. And now for some serious sarcasm. The basic point is that the recession of 2007 wasn't a typical postwar slump. Ben Bernanke needs to create a commodity bubble to replace the housing bubble.